Bloody Elbow’s striking specialist Connor Ruebusch breaks down Max Holloway’s quick and clever feet. 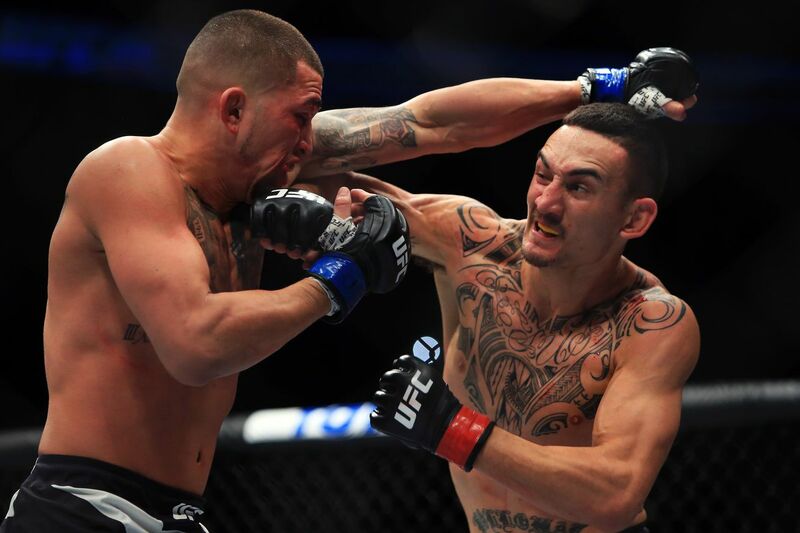 This weekend at UFC 236, Max Holloway will fight Dustin Poirier for the second time. Their first meeting was seven years and, for Holloway, 18 fights ago. In fact, it was only Holloway’s fifth professional bout, ever, and his first contest in the UFC, which has many questioning its predictive power, considering that Holloway has since made himself featherweight champion and, in the meantime, developed into the best fighter on the planet, pound-for-pound. Holloway’s schedule is as unquestionably solid as his skillset. Before his dominant win over the previously undefeated Brian Ortega last December, Holloway twice finished Jose Aldo, the greatest featherweight of all time. Those are just two of the names in a 13-fight win streak stretching back six years. And as for the skillset, well... suffice it to say that Holloway is one of the most creative, flexible, and adaptive fighters in the sport today. The only thing Max doesn’t do (and which Dustin Poirier does) is knock people out with single punches. Yet he makes up for it by throwing upwards of 13 strikes per minute, with tremendous accuracy, slowly building to a breakneck pace that, since 2013, only three fighters have been able to survive. Sure, his power is average, at best; but in five 25-minute bouts, no opponent of Holloway’s has ever made it to the final round. Footwork is the foundation of all of this. Holloway is one of MMA’s very best movers. His feet are as intelligent as they are agile. And while sometimes footwork is boring, Holloway’s is anything but. There’s nothing quite like the sight of him bumping and shuffling from one angle to another, flowing from defense to offense without a seam or second thought, graceful and very, very violent. Before Holloway tests those feet against Dustin Poirier at UFC 236, let’s take a quick look at a few of his best dance moves. Before we talk about some of Holloway’s flashier moves, let’s understood just how good he is at the basics. There are all kinds of ways you could try to quantify what equals “good footwork,” but nothing is more important than the one cardinal rule: keep your feet under you, at all times. Fans of MMA will have seen this rule broken more times than they can count. More times than Cody Garbrandt has lost an exchange of right hands. More than Dana White has called his wife to apologetically inform her that he’ll be working late. In MMA, practically nobody keeps their feet under them more than, say, 50 percent of the time. Max Holloway is a strong exception. While throwing more strikes than virtually any other fighter in the sport, he also covers more distance than most. And yet he almost never leaves his feet behind. 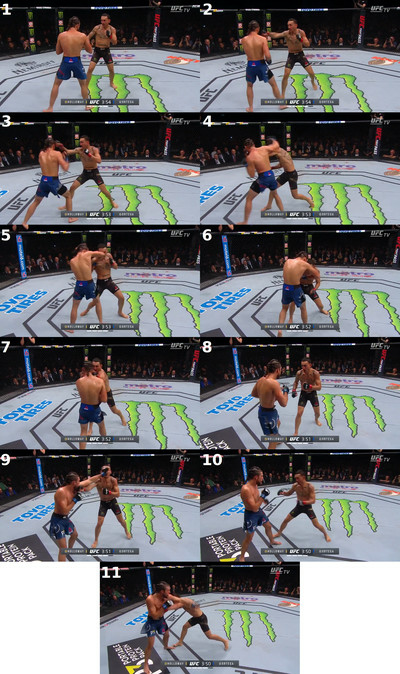 For reference, here are nine of the 307 strikes he landed over the course of twenty minutes against Brian Ortega. See how he keeps the pressure on his foe without ever losing his balance. 1. Holloway advances on Brian Ortega from the center of the Octagon. 2. Probing with his jab, he takes a step forward with his lead foot. 3. As soon as the back foot catches up, Max is jabbing and stepping forward again. He gets closer this time, but makes sure to step off toward his right. 4. So when Ortega throws a retreating hook, Holloway has the angle to sneak his straight left inside its arc. 5. Holloway follows up with a hook to the body. Note how his feet and hips swivel as he throws his weight into the shot. 6. As the body shot forces Ortega back toward his right, Holloway again adjusts his lead foot, lining himself up with his opponent. 7. This wide left hand collides with Ortega’s jaw as he momentarily loses his stance. 8. Ortega has backed up almost all the way to the fence, in a more-or-less straight line. 9. He finally throws a jab, trying to regain some space and momentum. 10. But Holloway knows where Ortega is headed. Absorbing the jab, he once again opens his stance, stepping off to Ortega’s left. 11. So when Ortega tries to jab again, Max has no trouble slipping it as he lands a cross to the gut. Distance is the best form of defense, because it is the least prone to error. If the opponent is standing too far away to hit you, then he’ll have to advance. Whenever he does, you can take a step backward. Maintain that gap, and no man without a ranged weapon will ever succeed in hitting you. Ranged weapons aren’t really allowed in MMA, but there are a great deal of other threats to worry about. Whether it’s a punch, kick, knee, elbow, takedown, or some spinning or flying variation of any of these, the right amount of distance will always work. As such, a straightforward retreat is by far the most common standup defense seen in this sport. And, most of the time, it works pretty well. In its most basic sense, this is the kind of defense offered by Brian Ortega, who begins in the center of the cage in the sequence above, and ends up with his back near the fence. Each time he is threatened, he takes a step back without even thinking. Yet Holloway lands clean punches throughout the exchange, never allowing Ortega to get out of range once he has him there, nor to drift out of the line of fire. And he does so without exposing himself to anything more threatening than a light jab. The trick is in his subtle footwork. 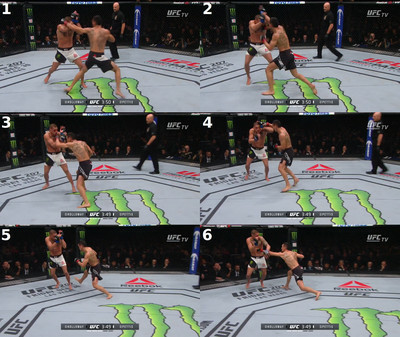 Pay special attention to Holloway’s feet in each of the above stills, and you will see that the champion is constantly adjusting his position, accounting for every move Ortega makes, even twisting to throw weight into his punches as he moves, without ever doing more work than necessary. When Ortega moves to the left, Holloway opens his stance to keep the crosshairs on him. When Ortega moves to the right, Holloway pivots without thinking, and continues the attack. When Ortega backs straight up, Holloway edges his way forward, maintaining perfect distance at all times, usually while punching. Like Israel Adesanya, who also fights at UFC 236, Holloway’s flashy moves tend to overshadow the simple, subtle footwork that makes up the foundation of his game. But how about the flashier stuff, eh? Holloway is a celebrated stance-switcher, equally comfortable in either orthodox or southpaw, and not too bad out of a square stance, either. While this is a more common practice in MMA than in boxing, there are few who do it as naturally, or as intelligently, as Max. As we have already seen, Holloway’s footwork is essential to his incredible output. This is a fighter who consistently frustrates his opponents’ efforts to hit him, while spending more and more time within punching range as the fight carries on. This is one way that Max keeps a defensive, flighty opponent in his sights. 1. Holloway steps in behind a sweeping left hook. Pettis immediately begins to retreat. 3. ...in order to shift into a southpaw stance. As Holloway steps through, he sticks his left hand in Pettis’ face to keep him on the defensive. 4. Another adjustment of feet is required, as Pettis continues to retreat. Holloway hop-steps forward, still in southpaw, this time distracting Pettis with a lead right hook. 6. ...and Max catches Pettis with a left straight to the belly before he can get away. When a fighter walks forward or backward, switching from orthodox (left foot forward) to southpaw (right foot forward) with every stride, that’s called a shift. There are a number of applications for such a technique, but at its core, a shift allows the fighter in question to cover distance more quickly and fluidly than he could have had he stuck to his original stance the entire time. While the little, nuanced steps were more enough for the sluggish retreat of Brian Ortega, in this example Anthony Pettis all but leaps out of range as soon as Max begins his assault. He covers the same distance as Ortega in a quarter the time. As such, Holloway has to pull some more dramatic moves to catch up with him. He does not merely shift his stance, however. Not outright. Unlike the textbook footwork we saw in the first sequence, a shift is an inherently risky maneuver. Holloway’s legs are only capable of absorbing the impact of a blow when his feet are staggered, but each shift forces him to square himself to his opponent, even if just for a moment. Even against a foe as pathologically incapable of countering off the back foot as Anthony Pettis, Holloway is loathe to expose himself completely. Thus, he makes sure to occupy Pettis’ eyes—and therefore his defense—at all times as he moves forward. Anthony has no time to take advantage of Holloway’s slippery stance, as he is constantly being poked and prodded by one hand or another. When opponents turn cautious and defensive, Holloway uses the constantly probing, stabbing threat of of his jab to keep them that way. Brian Ortega demonstrated some real valor against our Hawaiian hero, but looking back, it’s easy to argue that he was always going to wind up at the center of a circle of Max Holloways. Ortega is a marvelous grappler and obviously a quick study when it comes to boxing, but that side of his game is still developing. Jose Aldo’s fist-fighting, on the other hand, is long past its fetal stage. When it comes to striking defense, specifically, no mixed martial artist has ever done it better. In fact, when he and Holloway met for the first time at UFC 212, Aldo outscored the young challenger in both of the first two rounds, landing more than half of his own strikes while keeping Holloway well under the 40 percent mark. And yet, as he does, Holloway adjusted. His pace increased, and he began to draw the veteran fighter into one reckless exchange after another. Ultimately, the champ’s style proved unable to stand up to the Blessed test. He simply couldn’t keep up with the angles and the aggression that have become Holloway’s hallmarks—and there’s no shame in that. After all, no man is unbeatable, and Max Holloway was literally the first fighter who ever managed to run circles around Jose Aldo. 1. Holloway evades a right hand from Aldo by circling away from it. 2. As Aldo adjusts his own feet, Max suddenly changes direction. 3. He steps in from an orthodox position, landing a lead right hand. 4. As Aldo begins to sidestep, Holloway lets his right leg fall through into a southpaw stance. 5. Suddenly, Max is perfectly aimed while Aldo is square, and wide open. 6. But Aldo will lean on power and ferocity wherever technique fails, and Holloway knows it. He hangs back rather than walking into Aldo’s left hook, and sidles back into orthodox in the meantime. 7. Stepping off to his left, Holloway lines up his right hand. He occupies Aldo with a left hand, first. 8. Then he lets go the right hook, but Aldo steps out of range before he can land it. 9. Holloway keeps the pressure on. Still standing orthodox, he enters with a jab. 11. ...then faces Aldo to his right, suddenly standing southpaw. Here, we see just how bewitching Holloway’s footwork can be. Shifting can be a great way to move forward at speed, but being equally comfortable in both stances opens up a whole world of angles that most other fighters simply cannot access. Each time Holloway throws a strike—keeping his feet under him, as he does it—he takes a look at his opponent. In the split second after impact, he seems to analyze Aldo with a glance, deciding then and there (or, perhaps, simply feeling) where to go next. At times he steps through his strike, closing the distance aggressively as he shifts into the opposite stance. At other times, when Aldo seems to expect such a move, Holloway hangs back, letting his man miss before continuing the assault. Each time Holloway moves from one angle to another, he has only to swivel a few degrees before he is facing Aldo again. Without any preference for either stance, he can keep relentless pressure on his foe, never needing to pause to regain his balance, or adjust the position of his feet. 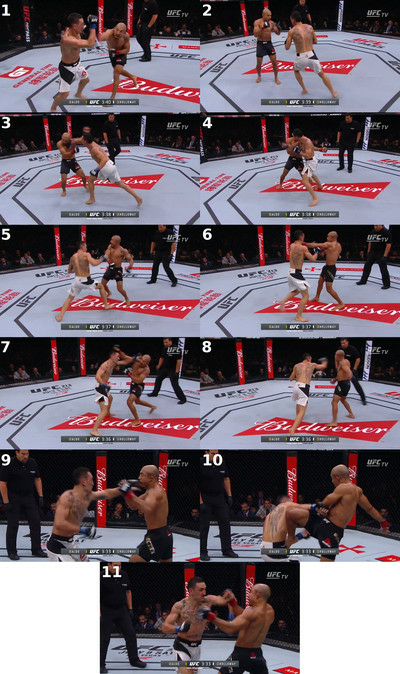 Aldo may block or evade a fair number of Holloway’s strikes in this sequence—but, folks, it’s Jose Aldo. And whatever momentary difficulties Holloway faced as a result of Aldo’s defense only serve to underscore his eventual triumph. Max Holloway beat up Brian Ortega, defanged Anthony Pettis, and outsmarted Jose Aldo—twice. And while his hands were certainly helpful, he was able to do it all thanks to his feet. For more on Holloway vs Poirier and the rest of UFC 236, check out the latest episode of Heavy Hands, the original podcast dedicated to the finer points of face-punching.